Article by Elizabeth Grant and Thalia Anthony. The continuing over-representation of Aboriginal Australians in the criminal justice system has resulted in a reimagining of courthouses in locations where Aboriginal people constitute a high proportion of the population. Kununurra is located at the eastern extremity of the Kimberley Region, 3,200 kilometres north east of Perth. The town has a population of 7,775 people increasing threefold during the dry season. Over half of the population identify as being of Aboriginal descent who are predominately Miriuwung and Gajerrong people, the recognised Native Title holders of Kununurra area. The population of Kununurra has grown significantly in the last five years and forecast to double in size in the next decade. The existing Kununurra Court House was inadequate to discharge the volume of judicial work undertaken (Martin 2009) and planning for a new court complex commenced in 2011. Efforts have been made to create a less formal court environment where Aboriginal people are more comfortable. 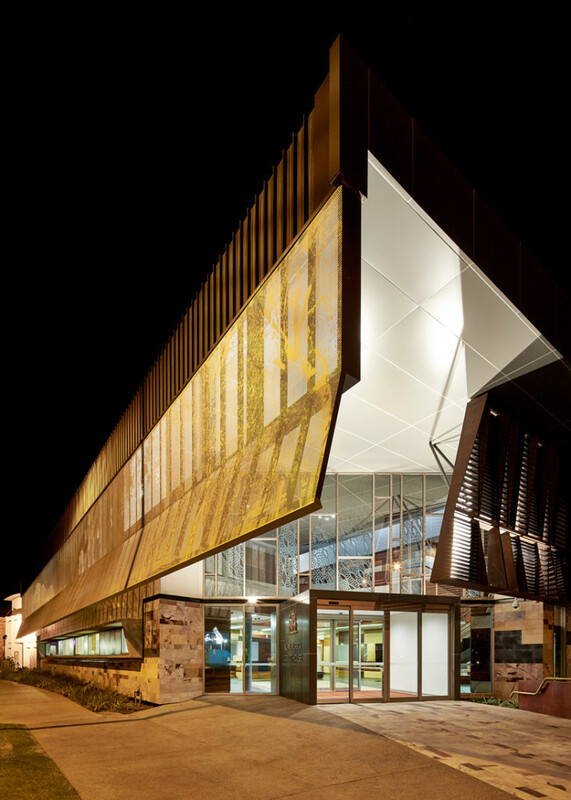 Designed jointly by TAG Architects and iredale pedersen hook, the new Kununurra courthouse was built on the site of the existing courthouse and co-located with the police station. The courthouse is a two-storey building is steel and concrete framed, constructed with a mixture of pre-cast concrete panels, stone and metal cladding with a metal roof. The building provides magistrates and jury courtrooms, facilities for mediation and trial conferences and a remote witness room, to ensure vulnerable witnesses, can testify without being in the courtroom. Other features include separate areas for jury deliberation, witnesses and victims of crime, interview rooms, holding cells located off the courtrooms and security monitoring. An Aboriginal Reference Group was established early in the design process to communicate the views of the Aboriginal community to the design team. Members gave input on various aspects of the design of the building, landscape architecture and public art. As a result of this collaboration, the design, colours and material finishes were chosen to reflect Indigenous socio-spatial needs, local cultures and surrounding landscape. Guiding principles for designing environments for Aboriginal users seek to provide connections between internal and exterior of buildings which allows users visual and aural surveillance of local and broader external environment. The Kununurra Court complex is designed to allow people to be connected to the external environment from inside the building. The buildings are oriented to maximise natural light and people are afforded views to the distant ranges and the horizon. The large courtroom spaces have external views (unusual in traditional courtrooms) to allow people to remain connected with the external environment. The design of the roof mirrors the outline of the distant ranges and creates a sense of space in the interior areas. Materials including natural timbers are also used throughout the building to connect with external stonework interspersed with glass panels. The socio-spatial needs of Aboriginal people were also considered in the design. Spaces need to facilitate the continuation of cultural practices such as avoidance practices, the separation of genders and privacy. Waiting areas within the Kununurra Courthouse are laid out informally to allowed people to wait individually, in small family groups or larger groups. Screens provide privacy to people who are waiting to diffuse potential conflict between users. A secure external courtyard is provided to allow people to wait outside before entering a court room. 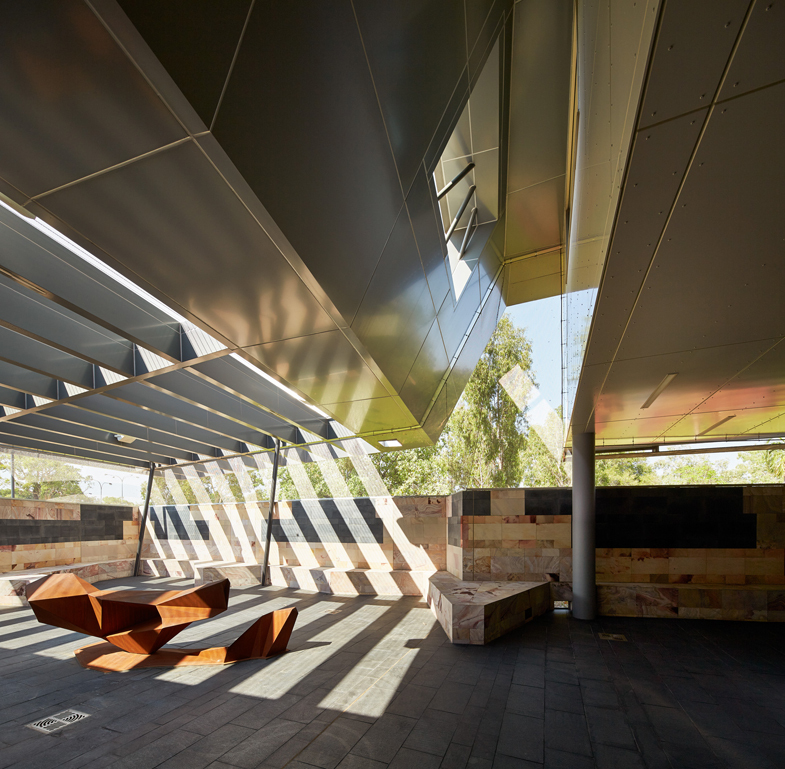 Aboriginal artists have made a significant contribution to the completed Kununurra Courthouse. More than 20 artists were engaged in creating artworks around the theme of Law and Culture. The artworks take many forms, from sculpture and painting, to designs integrated into the very fabric of the building. 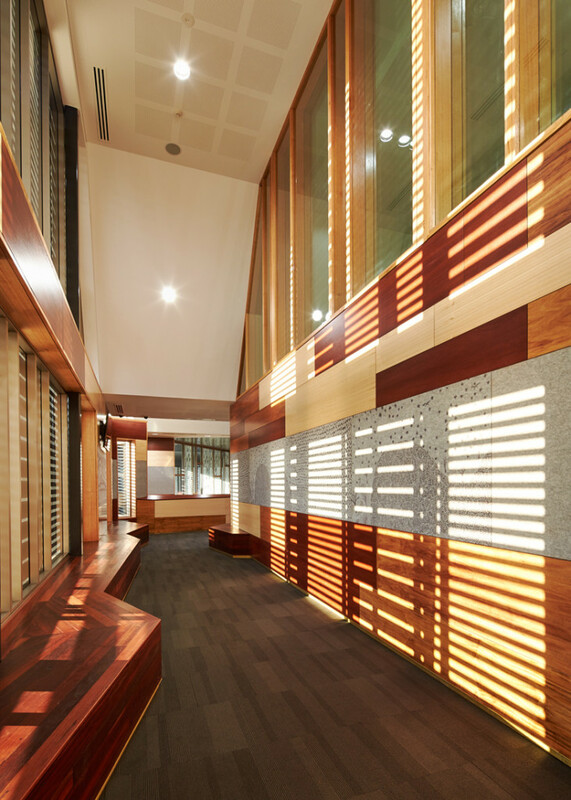 In total, 18 significant pieces of local Aboriginal artwork have been incorporated into the building’s interior. Artists from five Aboriginal family groups worked collaboratively to produce the artworks which share knowledge about country. A carved timber handrail at the base of the stairs depicts two intertwined snakes, proposing two systems of law, working side by side. A sculpture in the secure courtyard alludes to principles of ‘balance’ underpinning the legal system. Other artwork references the balancing rocks and geology forms that are characteristic of the region. 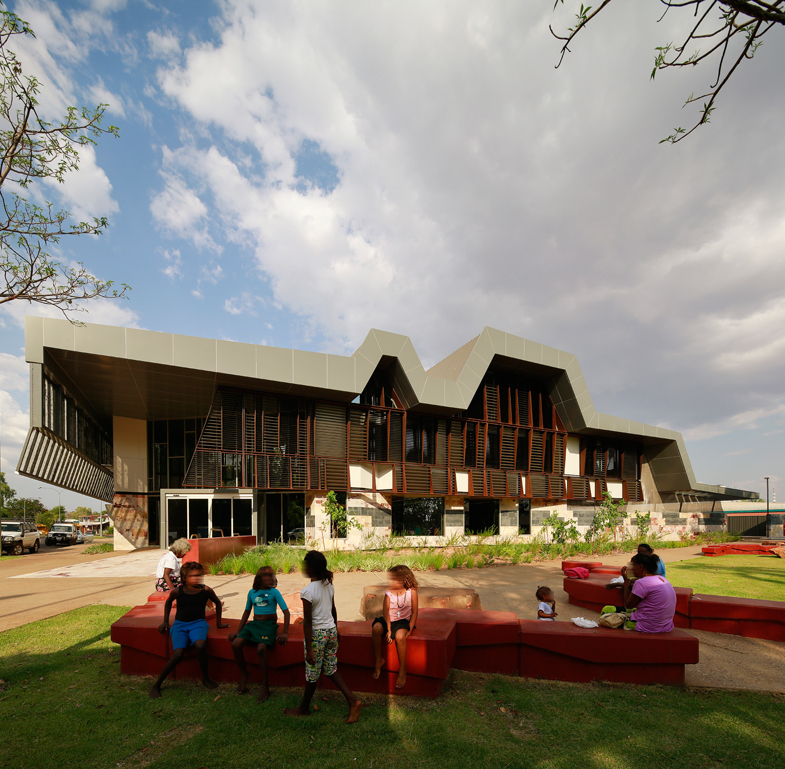 For example, the main entry houses a glass print design based on Nyamooli, a bush soap that grows near swamps, rivers and springs while perforated aluminium screening along the western side of the exterior of the building provides shading and presents a landscape scene of Lake Argyle. Historically, courthouses have been a means of alienating Aboriginal people from their community and place. 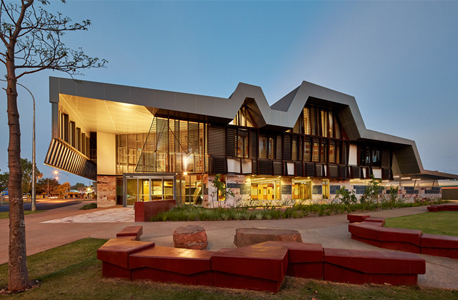 Kununurra courthouse is an example of integrating Aboriginal people through their input into the design and ultimately the provision of place that physically and aesthetically connects Aboriginal people with the judicial environment. The creation of spaces for conferencing and mediation enhance Indigenous peoples’ involvement in judicial processes beyond the classic adversarial courtroom. The courthouse design reflects the intersection of the justice system with Indigenous worldviews. 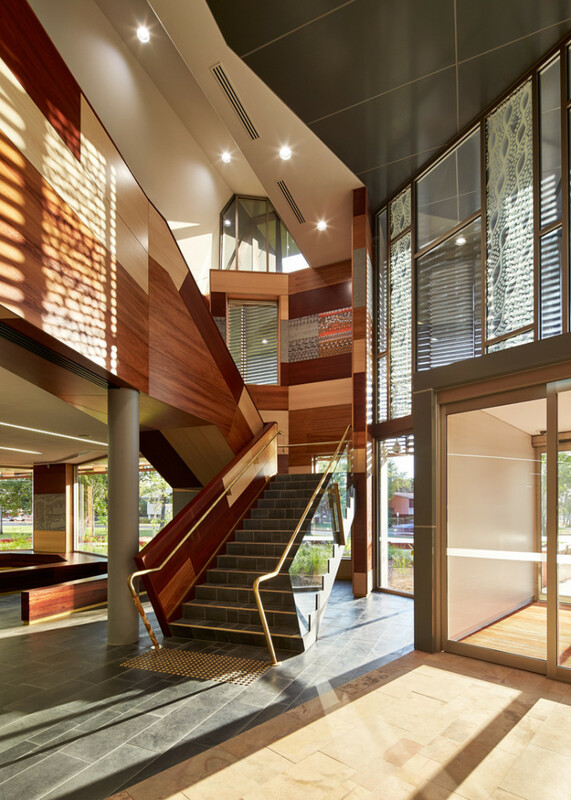 For a further insight into indigenous identity in our built environment, including the William Barak building, read Building Indigenous awareness: Q+A with Rueben Berg, practicing architect and founder of Indigenous Architecture and Design Victoria. Dr. Elizabeth Grant is a Senior Lecturer within the Office of the Deputy Vice Chancellor and Vice President (Academic) and a researcher within the Centre for Housing, Urban and Regional Planning (CHURP) at the University of Adelaide. She also lectures at the School of Architecture and Built Environment at the University of Adelaide. This is such a fabulous acknowledgement of our forebear’s ‘Place’! There should be MUCH more!